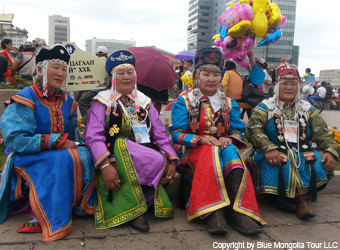 Naadam nationwide festival, originated many centuries ago as a test of courage, strength, daring and horsemanship necessary for nomads and warriors, is celebrated in 11-12, July. 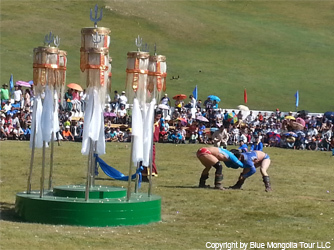 Naadam festival consists of 3 main tournaments: horseracing, archery and wrestling. 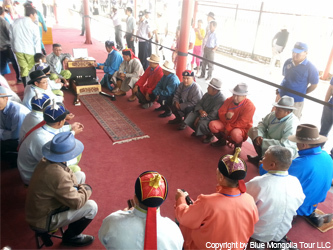 Before 1921, Naadam was held for state important celebrations or anniversaries, later Naadam festival has been held in July for the anniversary of victory in battles of liberation Mongolian from Chinese people. 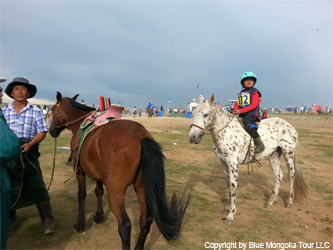 Approximately, more than 1000 horses, 500 wrestlers, 200 bowmen participate Naadam Festival, which is held only in Ulaanbaatar. 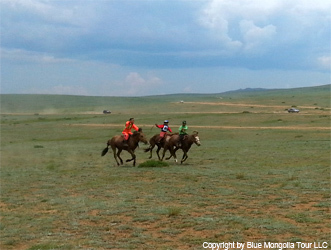 In Ulaanbaatar, totally more than 1800 horses, divided into 6 age groups take part in state horseracing competition. The racing distance is different depending on horses' age. Stallions race in distance of 35 kms, but the foals compete in 15 kms. The most charming and sweet ones are the kid jockeys aged 4-9 hours. Traditionally nice dressed kid jockeys sing a special worshipping long song loudly for their horses, preparing their horses for galloping in the race competition. The winner horse is rewarded by title “champion”, but the most last coming horse-foal is conferred a title of ”Full stomach”. Then it proclaims a toast for them, like rush horse the toast utters by chant. 1024 outstanding strongest competitors wrestle in 9 rounds wrestling in Ulaanbaatar . There is no category of weight and age. All wrestlers dressed in national wrestling costumes: boots, the tight fitting briefs, jacket with no chest and “hero” hat. According to lore, the jackets were used to cover the chest until a disguised woman entered the competition and won. The jackets were redesigned to prevent any females from taking part in the wrestling. The selected wrestlers are awarded with titles of the strongest 3 animals: falcon, elephant, lion and champion. Falcon is awarded to a man, who win 5 rounds, elephant is for 7 round winners, lion is 9 rounds winner, but 2 times winner for 9 rounds is called champion. 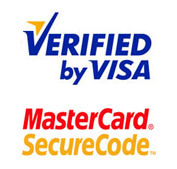 Archery is held from the ancient time, the source is from ancient army activities. Archery contestants take aim at target of fist-sized baskets. Bowman take more scores for their each success shooting and bowing in different methods are held by local people. Only in archery competition women are allowed to participate. Bone shooting is sometimes added to the venue. In this game, the participants flick sheep anklebones at a target of stacked bones. This is again one of the ancient games as the same as horse race and archery shooting. 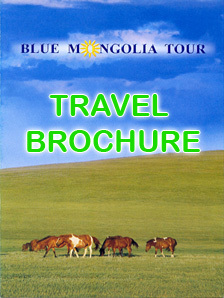 The main origin from 13 century and Chinggis Khan's period. 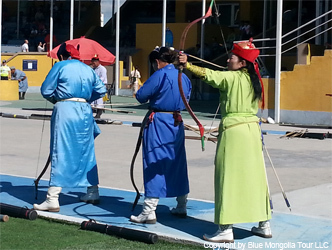 In peaceful time the mongolian ancint soldires are needed to have practice not to lose the power of arms and fingers, so they initiated sheep/goat ankle bone targeting tournament to enjoy indoors in severe winter time. In Manchu Dynasty period and soialist period this game was not allowed to play among mongols. Later after 1990 this game came back to mongols' daily life and holiday entertainment. This competition consists of groups of 6+1 men trying to flick an ankle bone to a target another ankle bone about 9.70 metres away. It is very popular with the masses and cheering is encouraged. This was a great way to get our juices flowing for Naadam and lots of cheering and egging on the ankle-boners.